The final medical results from the National Veterinary Authority in Bucharest, Romania, confirm that at least two out of the three bison that died last week at the bison release site in the Țarcu Mountains, were infected by Bluetongue virus. European bison in the Tarcu Mountains nature reserve, Southern Carpathians, Romania. May 2014. In the last couple of weeks, three animals have died out of the 17 bison that were taken to the Southern Carpathians to be released into the wild. At least two of these bison in the Tarcu Mountains were infected by Bluetongue virus. The rest of the herd still seems to be in stable and healthy condition. The virus caught the animals right when they were changing their fur, the weather turned colder and it was a very wet autumn – all of course putting more strain on their bodies. This disease usually takes a lot of energy from the animals, and even when they survive, it usually takes them quite a long time to recover. 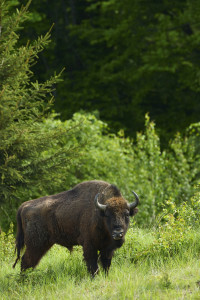 This last summer the so-called Bluetongue disease has affected 26 counties across Romania and killed some 400 livestock animals in at least 49 outbreak sites, including some that were very close to the bison rewilding area. The disease possibly spread up through the Balkans from Greece and Bulgaria, who have had many affected sites earlier on in the season. Bluetongue disease is a well-known livestock disease that can affect sheep, goats and cattle, but also wild ruminants like bison, buffalo and deer. This virus is spread via insectbites, especially from small midges, which also means that as the cold sets in, the frost tends to kill off the insects and outbreaks as this usually comes to an end. The local rewilding team restricted visits to the site at the beginning of autumn, in an effort to reduce external stress on the animals. The bison rangers have observed that the bison have now gained weight over the past weeks and are not showing signs of weakness or disease, which can mean that the animals developed anti-bodies against the virus. 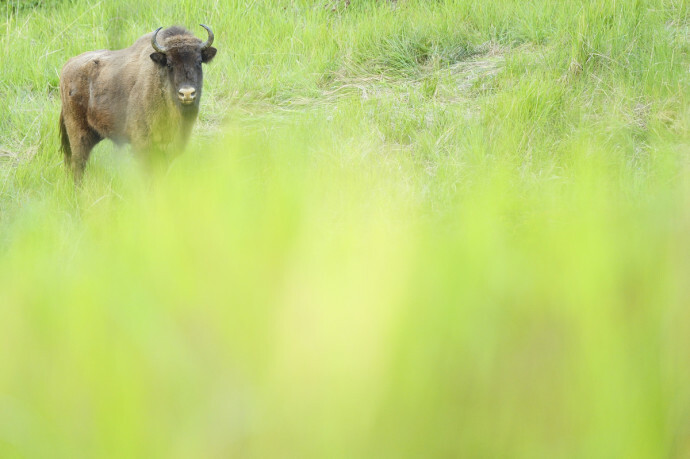 –“Our priority at the moment is to do everything in our power to help them strengthen their immune system during the cold season, which will be another challenging time for the bison,” says Adrian Hagatis of WWF-Romania and leader of the Southern Carpathians rewilding team. Release of European bison, Bison bonasus, in the Tarcu mountains nature reserve, Natura 2000 area, Southern Carpathians, Romania. The release was actioned by Rewilding Europe and WWF Romania in May 2014. In the next couple of weeks, WWF-Romania and Rewilding Europe will hold a seminar with vets and wildlife specialists as part of the rewilding project’s advisory working group. The specialists will come together to draw up an action plan for how to support the bison during the coming winter. Next spring, a new bison transport is being planned to this area, all part of the work to help build a long-term viable local population of about 500 bison here by 2024. In May 2015 it is planned to release the current bison herd finally into the wild and to then bring in additional animals to strengthen the existing herd at a regular basis.